Congratulations! This is a very exciting time for you and your family. 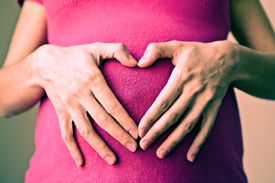 We understand how important achieving a healthy pregnancy and wellness are for you and your child. Over the last few years, it is becoming more and more obvious the connection between chiropractic care and achieving a healthy pregnancy. Chiropractic care, as it relates to pregnancy, involves an optimally working nervous system which will help both mother and child. Let’s explore the four specific stages of a healthy pregnancy and it’s direct connection with chiropractic care. Pre-Conception: Chiropractic care can prepare the body for carrying; making it strong, balanced and supple. Pregnancy: During pregnancy regular chiropractic care can appeal to a mom’s desire to a more natural approach to better health. Labor and Birth: Chiropractic care may help with optimal biomechanics, including functioning of the hips and spine, which may reduce the need for interventions during labor and birth. After Birth: Natural births can even stress a baby’s spine which may be a problem during breastfeeding. If your baby has a subluxation caused by the birthing process, your baby may be unable to comfortably turn his or her head to one side, thus interfering with the natural breastfeeding process. That being said take a deep breath and relax! Our well trained physicians use special methods to make adjustments safe and comfortable for you and your child. We’d be honored to walk alongside you through this wonderful and exciting time. Please contact us at (905) 835-1303 and schedule your no obligation appointment today!